Lake Nakuru is one of the Rift Valley soda lakes at an elevation of 1754 m above sea level. It lies to the south of Nakuru, in the rift valley of Kenya and is protected by Lake Nakuru National Park. The lake's abundance of algae attracts the vast quantity of flamingos that famously line the shore. Other birds also flourish in the area, as do warthogs, baboons and other large mammals. Black and white rhinos have also been introduced. The lake's level dropped dramatically in the early 1990s but has since largely recovered. Nakuru means "Dust or Dusty Place" in the Maasai language. Lake Nakuru National Park, close to Nakuru town, was established in 1961. It started off small, only encompassing the famous lake and the surrounding mountainous vicinity, but has since been extended to include a large part of the savannahs. Lake Nakuru is also protected under the Ramsar Convention on wetlands. 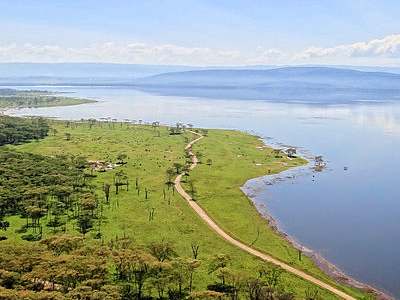 Lake Nakuru, a small (it varies from 5 to 45 square kilometers) shallow alkaline lake on the southern edge of the town of Nakuru lies about 164 kilometers north of Nairobi. It can therefore be visited in a day tour from the capital or more likely as part of a circuit taking in the Masai Mara or Lake Baringo and east to Samburu. The lake is World famous as the location of the greatest bird spectacle on earth - myriads of fuchsia pink flamingos whose numbers are legion, often more than a million - or even two million. They feed on the abundant algae, which thrives in the warm waters. 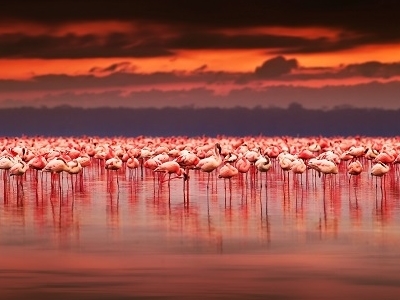 Scientists reckon that the flamingo population at Nakuru consumes about 250,000 kg of algae per hectare of surface area per year. The flamingos feed on algae, created from their droppings mixing in the warm alkaline waters, and plankton. But flamingo are not the only avian attraction, also present are two large fish eating birds, pelicans and cormorants. Despite the tepid and alkaline waters, a diminutive fish, Tilapia grahami has flourished after being introduced in the early 1960s. The lake is rich in other bird life. There are over 400 resident species on the lake and in the surrounding park. Thousands of both little grebes and white winged black terns are frequently seen as are stilts, avocets, ducks, and in the European winter the migrant waders. Zooplankton: The monogonont rotifer species Brachionus sp. Austria (belonging to the Brachionus plicatilis cryptic species complex) occurs in the lake. 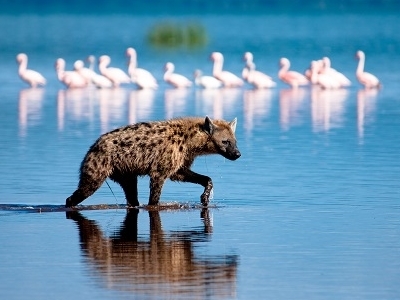 Here's the our members favorite photos of "Lakes in Lake Nakuru National Park". Upload your photo of Lake Nakuru! Get in touch with 8 Touristlink members who want to visit Lake Nakuru or with Abednegoh Kasuki, Wildrace Safaris and 26 others who already have been here.